Tucked away in the Ballard neighborhood, Delancey (1415 NW 70th; delanceyseattle.com) packs in crowds for simple-yet-elevated creations on charred New York–style crust. Try the White Pie with house ricotta and garlic paired with a Crikey IPA from nearby Reuben’s Brews. Downtown, celebrity restaurateur Tom Douglas’s Serious Pie (*316 Virginia St; seriouspieseattle.com) serves “Seattle-style” pizza using ingredients influenced by the seasons like chanterelles and Penn Cove clams. Pints and pitchers of Washington brews are on offer, from Matchless Brewing’s hoppy pale ale to a crisp pilsner from Dru Bru in Snoqualmie Pass. Family-friendly chainlet Tutta Bella (*multiple locations; tuttabella.com) offers an extensive menu and an always-changing selection of local taps, not to mention a custom amber ale crafted by Seattle’s Big Al Brewery. The Masonry (20 Roy St; themasonryseattle.com) in Lower Queen Anne presents an intentional pairing of craft beer and wood-fired pie, with 14 taps heavy on Belgian and farmhouse-style ales including the Solarian, a funky saison from Holy Mountain Brewing. Big Mario’s (multiple locations; bigmariosnewyorkpizza.com) Capitol Hill locale is the patron saint of the late-night set for foldable, expertly singed New York–style slices and full-to-the-brim pints of classic IPAs from locals like Georgetown Brewing Company. Dino’s Tomato Pie (1524 E Olive Way; dinostomatopie.com), a dive-y, wood-booth-filled offshoot of Delancey’s, serves square Sicilian-style pies seemingly beamed in from New Jersey to pair with a heavy selection of hometown taps. Beacon Hill newcomer Breezy Town Pizza (4864 Beacon Ave S; breezytownpizza.com) has carved out a space inside live music venue Clock-Out Lounge to serve its Chicago- and Detroit-inspired deep dish—on a house-made sourdough—plus an unfussy selection of local beer ranging from Silver City craft pours to Rainier. 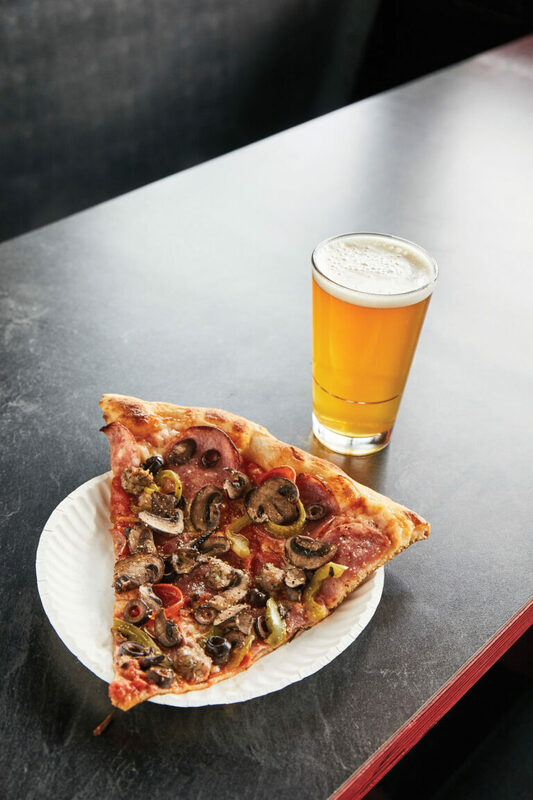 Farther afield, hop the water taxi from downtown to West Seattle for thin-crust slices at Supreme (4521 California Ave SW; supreme.bar) filled with unusual finds like Portuguese sausage and pineapple or fried chicken and kimchi, with local drafts on tap as well.